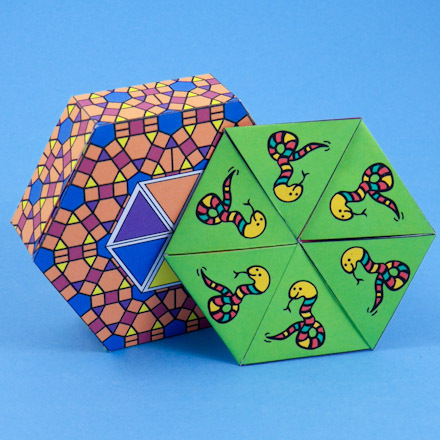 Make a gift that will fascinate puzzle-minded kids and adults. In this project, you'll make a set of hexaflexagons and a matching hexagonal box for storage. 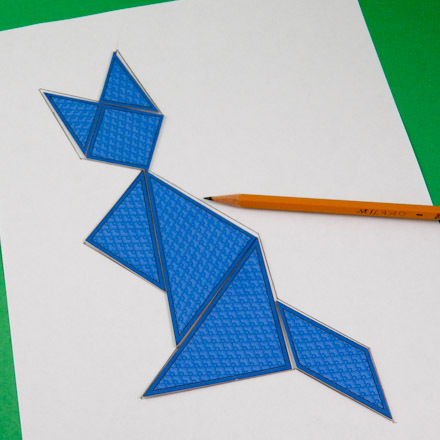 Flexagons are folded paper polygons that have the neat feature of changing faces as they are flexed. There are many types of flexagons with the hexaflexagons having a hexagonal-shape that fits perfectly into hexagonal boxes. 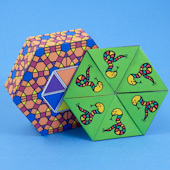 Related craft: See the Flexagons craft project for how to make tri-hexaflexagons (three-face hexaflexagons). 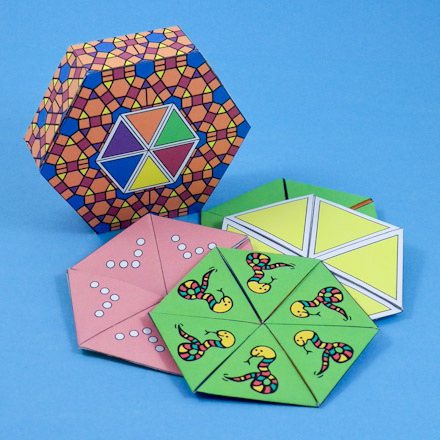 For the more complex six-face hexaflexagon, see the Hexa-hexaflexagons craft project. Both craft projects include printable patterns and flexing instructions. Related craft: See the Hexagon Box craft project for hexagonal box making instructions, more box patterns, and ideas on how to decorate your storage box. Optional: Decorative cardstock and ribbon. Choose the flexagons that you want to make. Select from the colored and black and white (B&W)patterns below to make two to four hexaflexagons. 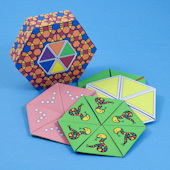 Or see the Hexa-hexaflexagons and Flexagons craft projects for more options. Choose a hexagonal box to make. Download and print the pattern. Make a lightweight box by printing directly on cardstock. For a stronger box, print a black and white pattern on computer paper, and trace or transfer the pattern to cardboard before proceeding. You might also print a colored pattern on paper and adhere to cardboard. Follow the instructions in the Hexa-hexaflexagons and Flexagons (tri-hexaflexagons) craft projects for making the hexaflexagons. It just a matter of cut, fold and glue, but attention to detail is important! Make straight and exact cuts, sharp and precise folds, and cover glued surfaces completely. The box can be made of cardstock or cardboard. If you are making a cardboard box, print a black and white pattern on paper and either trace or transfer the pattern to cardboard before proceeding. You might also print a colored pattern on paper and adhere to cardboard with spray adhesive. Follow the instructions for making the box in the Hexagon Box craft project. To make the hexagon box stronger, cut a piece of heavy cardboard the size of the bottom of the box. Put the cardboard in the bottom of the box. Or, you can make the box stronger by gluing the bottom flaps to the bottom lid, and gluing the bottom lid flap inside the box. Place all of the flexagons you made inside the box in layers. The flexagons will fit nicely in the box. Print and fold the flexing instruction sheet to include inside the box. That's it! Your flexagon boxed set is complete! 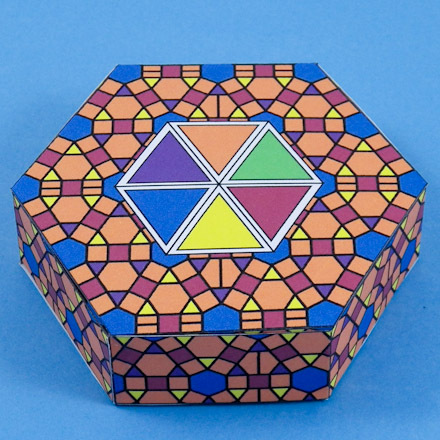 Tip: The hexagon box is deep enough to store four hexa-hexaflexagons and even more tri-hexaflexagons. 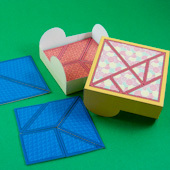 Tip: For another puzzle boxed set, see the Tangram Puzzle Boxed Set craft project. This boxed set holds four complete tangram puzzles. 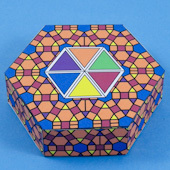 Tip: The patterned hexagon box can be made with or without the flexagon lid decoration. Tip: Print this flexing information sheet to include inside the box with the hexaflexagons.